Our chicken houses, coops and pens foster healthy, happy chickens. Here you'll find a variety of coops - from the simplest shelter to more elaborate designs. 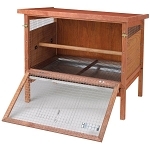 All will protect your chickens from the elements and give you and your birds more peace of mind.